Following the Return to Douala special feature (Dec 2014 / Jan 2015), where we went looking for the memorial to those lost in 1962 aboard G-ARUD, I was contacted by Amanda Lane. Amanda is the daughter of Captain Allen Frost, one of those lost onboard that fateful night in March 1962. Though never exactly sure where her father was buried, until the web page, Amanda had been passed two photos of the memorial by her family. These look to have been taken a few weeks after the accident when the memorial was completed. Amanda has kindly shared these photos with us and they show us that those lost on board were respectfully remembered with a very striking memorial. As we have seen, the memorial has aged, but when it was finished in 1965 it dominated the landscape next to the runway at Douala. The memorial has plaques to remember both the passengers and crew. 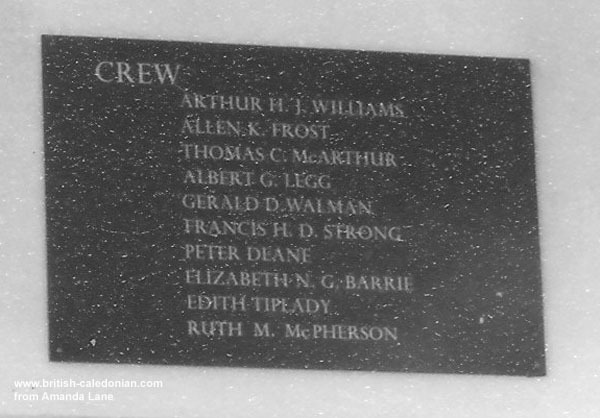 The Crew plaque is shown above. The plaques for the passengers are on 3 sides of the memorial base, the front being for the memorial dedication as can be seen to the left. 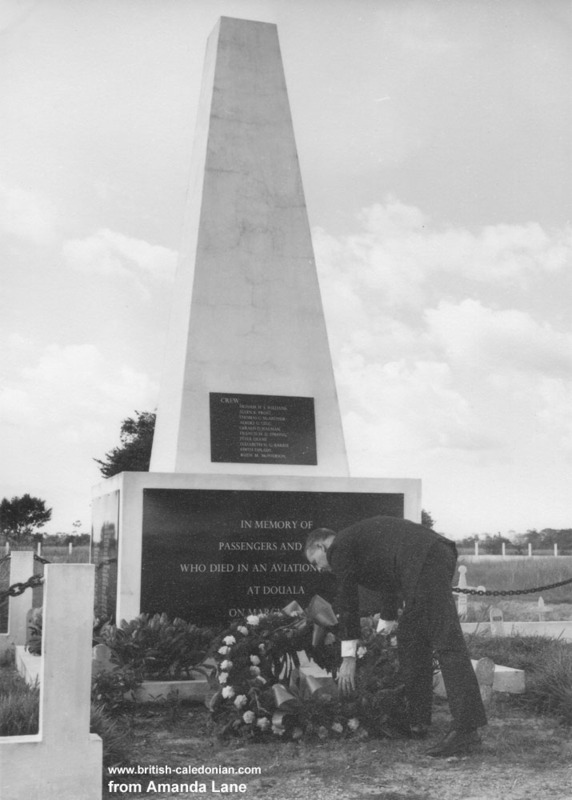 The wreath is being placed by Alan Bartlett at the memorial's dedication to remember those lost.